If you’ve been considering an investment in a Storm Shelter OKC, the FlatSafe Storm Shelter may be just what you’re looking for. This patented (#7428800) innovative new product is a below ground storm shelter intended for use in your home’s garage. Providing beyond F5 protection, it can be installed in an existing home and optimize the floor space beneath your car. Evaluated by four independent engineering firms, the FlatSafe Storm Shelter respects every aspect of your safety and convenience, including in-home access. The extensive research and development of the FlatSafe Storm Shelter addresses the fundamental components of a reliable tornado shelter. The most important considerations for a below grade shelter consist of proper ventilation, impact strength, corrosion control, buoyancy resistance, safe entry, and emergency egress. 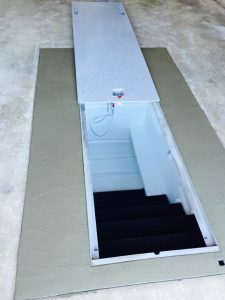 According to a National Storm Shelter Association (NSSA) Evaluator, Dr. James McDonald, a Professional Engineer, “The FlatSafe Storm Shelter designs are well documented and well thought out”. Dr. McDonald also mentioned, “The attention to detail is commendable”. In addition to the conclusions of a NSSA evaluator, Larry Tanner, a Professional Engineer and Research Associate at Texas Tech University, stated; “The Wind Engineering Research Center at Texas Tech University applauds your company’s efforts in providing a safe product for the consumer”. Transferable one-time, FlatSafe offers a 50-year corrosion warranty and is available before, during, and after the residential construction process. An Engineer’s structural analysis and drawings for architects, home builders, and permit offices are available upon request. FlatSafe is the premier Storm Shelter in OKC and surrounding areas.